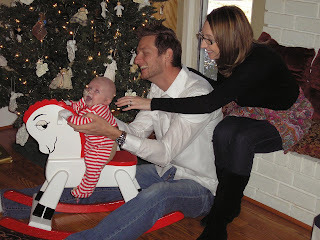 We are having such a wonderful Christmas holiday with Liam! It has been so great to spend time with family and enjoy this season of thanksgiving, love and joy. We are rejoicing for the life that God has given us, both in our Savior, Christ Jesus and our own son, Liam. Last night. we shared Christmas Eve with Dustin's sister and her family. We enjoyed watching our three nieces open all their gifts and play in all the snow we got! What a wonderful gift - to have snow on Christmas in TEXAS!! I cannot remember the last time we had snow even around the same week as Christmas, nonetheless on Christmas Eve. It was so beautiful and truly a blessing to see! Today we are at my parents house, spending Christmas day here with them, my grandma and my aunt. Liam received a really great gift today - My dad had his old rocking horse refurbished with new paint and rockers for Liam to have. What a cool thing for Liam to have from his grandpa. My grandma got it as a baby gift when my dad was born, so it is neat to see it passed down to our family. I really enjoyed sharing memories of childhood Christmas's growing up and to remember all the things I want to instill in Liam for this time of year and traditions I would like to have for our family going forward. From leaving cookies and carrots out on Christmas Eve for Santa and his reindeer, to hoping to volunteer each year as a family to serve others, I want Liam to experience the meaning of Christmas - Love, giving and joy. Liam is an amazing baby. He has grown so much the past month. He is awake and alert so much more now and just very happy and content all the time. He smiles a lot and is beginning to baby talk back at us when we talk to him. He is the joy of our life! We have an appointment next Tuesday to talk with our pediatrician about options for a more permanent feeding tube. I just pray that the Lord gives us guidance, wisdom and courage to make the decision on what is best for him right now and in the future. The Lord has given me a great peace about what is to come with his feeding issues. I know it is all in the Lord's hand and is going as purposed by Him. We had Liam's two appointments yesterday. The cardiologist appointment went really well. Liam's heart is doing great, his oxygen levels were at 85% (they like to see it anywhere from 70-85) and he now weighs in at 11 lbs. 15 oz. He is growing right on schedule for where he needs to be. Dr. Verma still thinks his next surgery will be when he is around 8 months old, which puts it in about May of next year. After this next surgey, Liam will have to have a valve replacement surgery every 5 years or so until he is full grown, and then after that surgery whenever the valve wears out. This will be a life long road for him, and us. Unfortunately, science has not developed a valve that grows with the body yet. But, I have been researching online at the many discoveries and trials that are being done to help this issue. One of these advances is the use of a catheter method to replace the valve (article). The swallow study did not go as I had hoped. Liam is still aspirating at all thickness levels of formula. This means he still cannot be fed anything by mouth yet. We will not have anoher re-test for another 3 months. At this point, we have to decide between keeping the NG tube he currently has or having a more permanent G tube surgically placed directly into his stomach. There are risks and benefits to both methods, but I think the risk of the NG tube right now are greater than that of the G-tube surgery. The OT told us that the risk of infection is greater keeping the NG tube he has now than it is with the surgery for the G tube placement. This said, we have a big decision to make. 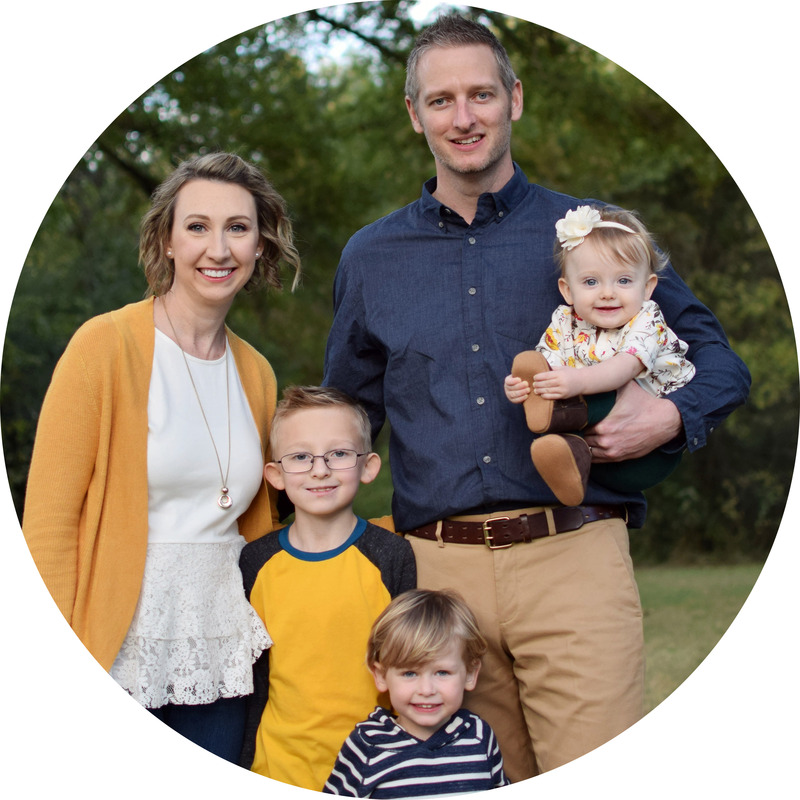 We still need to talk to our pediatrician and a surgeon to get answers to all our questions first, but I think Dustin and I are both leaning towards the surgery. We had Liam's ENT visit today. Despite Liam's changing cries and louder vocals, the ENT did not think his right chord was moving at all still. He looked at it for quite a while, and even though he thought at first it mught be moving, he said after watching it for awhile, he concluded that the left vocal chord is overcompensating for the right one, making it look like it was functioning. This was not all bad news, the good news is that he is compensating for the right one being paralyzed, therefore they are closing. As far as his eating goes, we will have to repeat the swallow study and see if he has made any progress getting his swallowing stronger. The ENT said the vocal chord issue just makes it more dangerous if he were to aspirate because his chords do not close hard enough to block his trachea from getting fluid down it. I started back to work this week. It is good to be in more of a routine during the day and be able to get my work done at work so I can come home and spend time with Liam. But I do miss my little guy a lot! Dustin and I have settled into a pretty good routine I think too as far as getting up in the morning and managing the early morning and evening feedings so we can both do what needs to be done. Liam has been a great sleeper at night too, so I hope that continues. I am so thankful that my dad is able to take care of Liam everyday for us so we do not have to put him in day care. My dad does a great job and just loves being able to be with Liam all day every day! It's neat too because I leave a little schedule notebook for him to write down all the events of the day, like diapers, feedings, what kind of mood Liam is in, etc. and it is so fun to read everyday to see what they did and how Liam was. What a great little keepsake we will have for Liam to when he is older! This past Monday Liam had his 2 month well check at the pediatricians. He is doing GREAT!! He was in the 35th percentile on height at 22.5 inches and 25th percentile on weight at 10 lbs. 9.5 oz. He is growing so much and we are thrilled. We have an appointment with the ENT to check his vocal chord next Monday. Our prayer is that his vocal chord has healed completely. From the sound of it, I think it has! Depending on what the ENT says, I am hoping to schedule a repeat swallow study again to see if this time Liam can pass and start taking a bottle. That will be a long road too though. Building his strength to take a whole feeding will take some time, so we will probably have to keep the tube in for a bit longer I am expecting. I am looking forward to the weekend! Dustin will be watching Liam all on his own for part of Saturday while I go out for a girl's day. Then I will be working hard on getting his birth announcements done! What a great Thanksgiving! We had family over all day yesterday for Thanksgiving. Dustin's sister and her husband had a wonderful turkey dinner planned and prepared for us. Liam got to meet and enjoy the whole family all day long....And boy was he exhausted - He has been sleeping great this week at night, so I'm praying that continues! We finally finished the nursery today. I saw the idea for the numbers paintings online a while back and thought it would be great to have the whole family paint one number each. So yesterday evening we had a family painting session and everyone really liked it and the paintings all turned out so great! Honestly I was a little worried at what the end result would be and thought I would have to touch up a lot, but everyone did a great job and all the numbers look great together up on the wall. I thought Liam would like to have a little piece of everyone's creativity in his room. We all signed the back of the paintings with little notes too. It was a lot of fun! 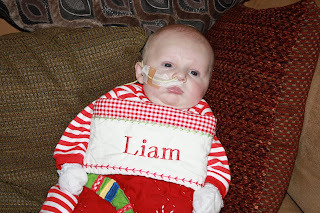 As far as Liam's milestones go, he is holding his head up more and more and is very strong in his arms and legs. I'm so proud of him! He is awake a lot longer too, so we actually get "playtime" now. In fact, Liam smiled as a reaction today, instead of just by accident, at me for the first time today! He is really getting to know my voice and is trying to mimick my facial expressions and making little coos and noises. And he loves Dustin too - he could stare at him for hours and hours. Our next doctor appointment is this coming Monday for the pediatrician. We have a lot of questions for her, as the tube feedings seem to be getting a little more complicated since he is growing and requiring more food. Since we feed him a set amount of food every three hours, we can't really feed him when he is hungry or stop when he is full like normal babies do. It is hard to tell how much to give him other than what the cardiologist ok's for us. He is getting fussy at almost every feeding now, thankfully the fussiness doesn't last very long, but it is still a lot to handle at times. He is also refluxing more now and has spit up occassionally, which could be a problem if he is still aspirating. I am really hoping his vocal chord is healed enough to compensate now. I am going to schedule that appointment soon, so we can have that checked out. Liam's cry is strong now, so I think it is healed some if not entirely. I go back to work on Monday. It is bittersweet, as I am looking forward to getting back to a normal routine, but will definately miss seeing Liam all day and not getting to be there for him during the day. My dad has graciously offered to take care of him for us at least until his next surgery so we don't have to put him in daycare and risk getting him sick. We are so fortunate to have him help us. But I know he loves Liam so much and he really enjoys taking care of him, he wouldn't have it any other way. This Thanksgiving was definately our best ever. We have so much to thank God for...I truly am counting my blessings! Today I took Liam to get his Synagis shot for RSV prevention. RSV is a upper respiratory infection that is easily spread and is common in children and can be dangerous for premies and high risk infants. We have to get Liam a shot every 28-30 days until April or May, whenever the season winds down. I have a feeling his vocal chord is starting to function properly again! Poor thing, he was soo good, but did have an outburst when the nurse gave him the shot in his thigh. It's weird that I like to hear him cry like that sometimes...it gives me hope that he is healing! Dustin's family is in town for Thanksgiving and it has been so nice to spend time with them and have them meet Liam. We are being a little paranoid about the germs, but hopefully everyone will stay healthy. Liam unforunately has been very colicky in the evening, so it's been nice to have someone to pass him too when things get a little rough for mom...I am going to up his feedings again to 100 ml and possibly try to feed him a little closer together in the evening to see if maybe he is just getting hungry, which is what my mom instinct is telling me is the case. We will see how it goes...I praying for no spitting up for overdoing it since he can't tell me when he is full! Otherwise, Liam is doing great. Hopefully his little evening attitudes are just a sign that he is growing, which is something to be thankful for! It's Friday! Liam had his second appointment with the Cardiologist this morning. He got a great report. Liam now weighs 9 lbs 14 oz., gaining about an ounce a day - right on track - we are SO blessed! At each of his cardiologist appointments he gets an EKG and an Echocardiogram, as well as his oxygen levels checked. Everything was right on target for where he needs to be. I also upped his feeding this week to 90 ml per feeding and will probably be going up again next week - as I can tell he is getting hungrier now. We meet with the pediatrician for his 2 month appointment a week from Monday - I can't beleive he is almost 8 weeks old already! The feeding tube is going good...and after I posted last, that very next day, I was getting Liam ready to start feeding and was carrying him, I looked down and his tube was out! He had pulled it out in a second's time....Ahhh! I was just about to re-tape it as I noticed earlier he could easily slide a finger in the loop and catch it...and low and behold he figured that one out real quick! I immediately called Dustin at work and he came home so we could put it back in (Unfortunately, it is a two man job...who would think with such a tiny baby??). Thankfully, we re-inserted it easily and got a good check test to make sure it was in right....There goes our nice trip to the ER. We are really looking forward to this weekend and next week. Dustin's sister and brother-in-law are coming to stay with us and we will have his family and my parents together at our house for Thanksgiving dinner. I love the holidays...and we have SOOOO much to be thankful for...this Thanksgiving is truly giving thanks to our Lord for ALL His blessings! So tonight we had our first experience inserting the tube all on our own. Since the tube is only good for 30 days, we decided to go ahead and change it out since Liam will haveto have one in another 6 weeks. It took three tries, but we finally got it down. I tried the first two times and couldn't get it - the first time the tube was coming back out of his mouth (scary...but the nurses told me it could happen and it was no big deal, just to try again if it happened) and the second time, I could not get the thing to go any further than his nasal passage. Dustin tried the third time and got it to go down. But, being the first time we had done this and me still being a little unsure about a lot of things to do with Liam, we went to the ER to get an x-ray to make sure it was placed right. We had a couple reasons why we wanted to double check though (if not just for pure sanity reasons and peace of mind). Liam was coughing a lot as we inserted the tube and it says on the instructions that coughing could mean it went down his trachea into his lungs. We also tried to aspirate a syringe to pull back fluid from his stomach, which we did not get anything out of at first. Normally when we pulled back the syringe before, we also got a couple cc's of fluid from his tummy. We were just feeling a little uncertain and decided we should just get it checked to be sure. So we took him over to Children's Hospital in Plano (our second trip there I should add - never did a post on that one...another "peace of mind" trip though) to the ER to have them do an x-ray. Thankfully we were successful and the x-ray showed the tube was in a good spot. Whew...we just got home a little while ago...we will have to plan that better next time! Dustin and I are getting a lot of opportunities to work together and grow as a couple through this journey with Liam. I was thinking tonight that this experience has magnified some of the areas we need to work on and also the areas where we are strong in our marriage. It is interesting to be learning how we both cope with difficult times and challenges that arise. It is something I had never thought about much before, but is so important to know about the other person. I want to be sensitive to how Dustin responds and reacts as I know he tries to be for me. I truly beleive our faith is what binds us together and is our foundation for being able to recognize these things about eachother. Our faith in the Lord as King in our life is also what teaches us to trust one another and love unconditionally. Needless to say, Dustin and I are growing closer and closer every day and I truly could not do this without him. Praise God too for my mom being able to watch Liam this morning so we could go to church for the first time in a couple months. It was so good to be back in our "home" around the people we love and consider to be part of our family. Our church has been a major support in our life, especially now. And today's message was about Radical Faith...how perfect is that! So I am sitting here, just realizing it is Friday, and the 13th at that. Gosh, my days have been so strewn together since we have been home. Kind of nice that we sort of have a routine down now though. I was thinking how our a year ago, even 6 weeks ago, was SO very different...But I do think the Lord's plan for our life has been flawless thus far - even though some days are better than others! Dustin is out getting us Chinese and sushi for dinner right now meanwhile Liam is asleep in my Moby on my chest...so sweet - I love him in it!! He just falls right to sleep every time! He has been more and more awake everyday which is fun but can be exhausting. We go from toy to toy while he is awake, but he loves just being held, so I try to hold him as much as I can. He is sleeping longer at night, about 4 hours instead of 3 which is great because more sleep for me! I have my alarm set at night, but I have been trying to let him wake up before I feed him. Hopefully the sleeping at night will get better, especially before I go back to work. It's just hard with the machine because you have to have some sort of routine based on the clock instead of when he wants to eat. Thankfully Liam seems to be gaining weight very well, which can sometimes be a big problem in heart babies because their heart is working extra hard all the time and requires a lot more calories. We just weighed him on our scale tonight and it looks like he is already up to 10 lbs! We had our repeat barium swallow test done today and it wasn't good news. Liam is still aspirating a small amount on even the thickest formula...his swallowing is just not strong enough to clear away the small amount of residual remaining. We will have to keep him on complete tube feedings for at least another 6 weeks, when we will go back to have the test done again. I broke down today while the nurse was explaining everything today...I just really wasn't prepared for him to have to be on this tube for much longer. It is especially hard on us at night because he gets really hungry and colicky. I keep thinking the bottle would soothe him and let him know we are meeting his needs and feeding him when he is telling us he is hungry. We also have to decide whether we are going to keep him on the NG tube he has now or if we will have to have a more permanent gastro tube surgically implaced. 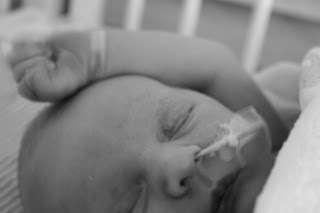 Hopefully our pediatrician will allow us the option to keep the NG tube like we have now...but I am not sure the ramifications of keeping this temporary solution for too much longer. The Lord has even today shown me how this trial will grow Dustin and I as parents and also benefit Liam. 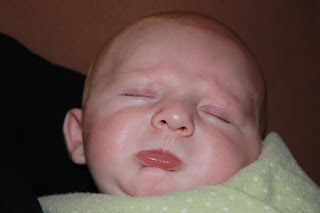 I really thought that the act of giving Liam a bottle would soothe him in his colic at night, and it may have. But I found another way to soothe him...the Moby wrap! I wanted to order a sling to carry Liam around with me and be able to be hands free. He is so calm and happy when I am holding him, so it just made perfect sense to get a sling to carry him to keep him, and me, happy and stress free. So I did some research and found the Moby wrap. There is definately a learning curve on how you put it on, as it is just a really LONG piece of sturdy knit fabric and you wrap it around you and the baby so it holds the baby on to you. It worked GREAT tonight...I wrapped Liam up in it kangaroo style when he was getting really fussy and he went instantly asleep...really, instantly. He stayed that way while I cleaned up the kitchen, got his bottles ready for the evening and did some laundry....awesome. Plus, the booklet that came with instructions had a lot of great tips and things to do to help your baby sleep better, relax, calm and thrive. Baby massage was one of the suggestions, so Dustin said he is going to do this with Liam every night. Even though today was another setback, I remembered again how everything we have gone through has been very purposeful - both for Liam's healing and our faith walk. I choose to believe that this is yet another trial that will be overcome both physically and spiritually. Our time at home so far has been really great. Liam is doing really well, and is for the most part a normal and healthy baby! Being a mom is the most wonderful job in the world and I am loving every moment of it! I have slowly been introducing Liam to some new daily activities that we are going to start doing together. Yesterday, we did some tummy time on a special tummy mat (I just LOVE to finally be able to use all the cool and fun gifts that people have given us!) and Liam did great. I think it was the first time that he has ever been on his stomach...I am not sure it's his favorite activity yet, as he kinda gave me a look like, "Ok, what kind of procedure are you going to do on me now?" but I think he'll get used to it. I was amazed at how he was able to manuever his little head around though. Although, he seemed to tire pretty quickly, so needless to say tummy time didn't last very long. Today I took Liam for his first outside adventure...ok, so it was just a walk around the neighborhood, but it was very refreshing. Probably more so for me, as I have not set foot outside in I can't remember how long. But it was SO nice outside I couldn't resist. My dad was here, so the three of us took a nice little walk around the block. Liam slept the whole time, so he missed all the scenery, but it's nice to know I have options for making him go to sleep! It's hard sometimes because I just want to tote him along everywhere I want to go, but he is still so fragile. His immune system is very vulnerable and the doctors say if he even gets a cold or runny nose, it could land us back in the hospital. But keeping him safe and healthy are top priorities, at whatever the cost. Our next appointment is next Wednesday and Liam will have a repeat Barium swallow study done to see if he can start bottle feeding. Please be praying for us! This is the last step to really being a normal baby and a huge indicator of progress that he is making in his overall strength and growth too. Pray that his vocal chord is moving and that his strength is enough to compensate so he can bottle feed. We are anxiously awaiting the day to say good-bye to that feeding tube! Thought I would just post some new pictures today - Liam's Mimi had fun dressing him up and taking some pictures while we were out car shopping. Happy Halloween!! We had a follow-up appointment today with our cardiologist, Dr. Verma, that went really well. Liam had an EKG, and echo-cardiogram and his oxygen saturations checked. Dr. Verma said that everything looked really good and the shunt is working just fine. Liam weighed in today at 8 lbs. 3 oz., up 7.5 oz from Tuesday! He is growing so fast! Liam has been awake more and more lately...Like right now as I type this, he usually would be asleep, but is wide awake. Although I think part of this is the diet he is on - formula fortified breastmilk makes his tummy very bubbly and I think it bothers him a lot, but he has to have the higher calorie in order for him to gain weight. Dr. Verma said since his heart is using more calories than normal babies, we have to compensate for that. I have already changed the formula once, and may be looking to change again if he doesn't seem to tolerate it any better. Poor little guy, I know he is uncomfortable. This has been a long week of adjusting to home life. It is so good to be home, but honestly I had a couple breakdowns this week as I realized the tremendous amount of responsibility Dustin and I have in caring for Liam. I am frustrated and terrified at times because I feel so unprepared and inadequate. Thankfully the Lord gave me opportunities to build my faith and encourage me. The Lord keeps reminding me that he appointed me for this job and he will equip me with whatever I need to carry it out, I just need to trust Him. On another note, the accident Dustin was in couple weeks ago ended up totaling out our car...SO, we get to go car shopping tomorrow. My parents are coming over to watch Liam and I know my mom is so excited to play dress up with him. Liam has a couple of cute halloween outfits she is anxiously awaiting to deck him out in. I'm leaving her the camera, so we'll see what happens! We are so glad to be home. We finally have down a routine with feeding and all the normal baby stuff, so it feels really good to do our own thing with Liam. It is still a learning experience with him (as I'm sure it will be for the rest of his life! ), but we are doing the best we can and I think it's working well. It is still a little overwhelming and scary at times to know the entirety of what we are responsible for, this little life of his is in our hands! It is a faith walk everyday for the Lord to calm my spirit and give me peace and strength to do the job He appointed me to do. But the Lord has blessed us with a wonderful little boy, as he sleeps a lot, fusses very little and I would guess he would sleep through the night as I have always had to wake him to do his feeda at night and he is as content as can be. I don't think we could ask for anything more right now! We visited the pediatrician today for the first time. It was our first official little outing with him. My dad came up to help out since Dustin is now back at work. The appointment went really well, I think Dr. Bain is going to be a great fit for Liam and his needs. She says she deals with a lot of special care kids, and she feels completely comfortable caring for Liam. She already increased his feeding amount and just told us he needs to grow a bit more, but all around he is looking very good! I am just happy we got out of there without him peeing on someone or something as he had to have his diaper removed a couple times! I also learned today that it takes me longer to get Liam ready to go somewhere than it does myself! And for those who know me well, that's a good chunk of time! I knew from much advice to always pack lots of changes of clothes and plenty of diapers and wipes so that's all I really went with! Thankfully that is all he needed for today's excursion! We are all finally together for our first night alone as a family! Well, there are still nurses around and we are still at the hospital, but reality is slowly starting to take over. And of course, I am not taking everyones advice of sleeping when the baby is sleeping (Liam is sound asleep right now, and so is Dustin not to mention! )...I think I am too anxious to sleep. We just finished his feed not too long ago and I think we did ok. The equipment we will use at home is not like the equipment the nurses use here, so that took a little adjusting to figure out how its all going to work. At 11:30 the nurse is going to come back to show me how to do a sponge bath around his scars, since the bath was the only thing I never saw the nurses do because they do it late at night. We also have to practice putting his tube down again...They make you do it twice. I think it's only fair that Dustin do it this time! It's a weird feeling to know that tomorrow we will be leaving the hospital and closing the chapter on this part of our life. This place has literally been our home for the past 3 weeks, and as excited as I am to finally be going home, a part of me will miss it here. We had a lot of memories in this place, a lot of pain, but also huge triumphs. I caught myself a couple times already glancing upwards towards the monitor that is no longer there and reaching for the cords that are no longer attached. I feel a little uneasy to leave the comfort of hospital care, of the peace and reassurance the people here can provide. But the Lord needs to be that for us...and I know He will be. Well, I may try to take a little cat nap before the routine starts over again soon. May the Lord watch over us and give us peace for tonight! Today was a busy day - getting ready for tomorrow night when we will room in with Liam and finally go home Friday! YEA!! Liam had his circumscision today. Glad we got that out of the way. Poor thing, luckily he took it very well and was not even really fussy afterwards. We also received the home equipment that we will be using to feed him with. I got a mini crash course in how to use it. Thankfully, tomorrow I will have some feedings to practice with while the nurse is there. SO much information to remember! I hope I can do this! The rooming in should be interesting. We basically stay in a hospital room with one twin bed and a chair and Liam's crib. We are assigned a nurse who is there to answer questions (or if a problem arises) and I think she checks on us every four hours or so. But we are responsible for caring for him like we would do at home. Liam will be fed every 3 hours on the dot. We have to maintain the same schedule that the doctors have him on. I am curious to see how this all pans out....With me having to pump and feed him (his feedings are given over an hour time period), I think my days of sleep are over...but I guess that is normal for any new mom come to think of it! Dustin and I will start our stay at around 8 pm tomorrow night and then go until they discharge us on Friday, assuming all goes well. I can't believe it is so close!! God is good! Today while driving to the hospital, I had a sweet moment in the car with the Lord. I was listening to my usual Power FM and I truly felt God was in the car with me! He was reminding me of how far he had brought me in my life, how He had led me to the exact place in time that I stand in right now...this whole time preparing me and encouraging me for what lie ahead. He reminded me He is always with me. He spoke to me about feeling anxious for the future with Liam and He told me "I am the same today as I was yesterday and will be tomorrow...do not worry! I will be there for you like I have always been in the past, for my love for you, my child, is unconditional and unchanging". Thank you Lord, for reminding me of how far I have come, and how far I can go with You by my side! Liam is doing great today - a little more awake and verbal than he has been in the past, but doing great. My day here basically consists of changing diapers, getting his feeding ready, holding him while he eats, going to fetch his next meal (i.e. pumping =)) and trying to get things taken care of and down a bite to eat in between. Whew....I am starting to get a little anxious about going home. Lots to do and organizing a routine and game plan is going to be the key to my sanity...hopefully! Dustin and I and my parents are all taking a CPR class tonight. Definately a must have course especially now our little one has a good chance of possibly needing it some day. Going to make it a long night here though...and I am already exhausted. Everything still looks good to go home this week. I am going to run some errands tomorrow morning and indulge a little and get my hair done before Liam comes home. I am sooo excited that we are days away from starting our new family life together at our home!! Should be a WONDERFUL weekend!! Today was a non-eventful day - and I am really starting to like days like today! Liam was as much a normal baby as the next, crying when his diaper needed changing or just to be held. It's nice that I think I am finally learning who my child is - I did pretty well distinguishing what he needed today. 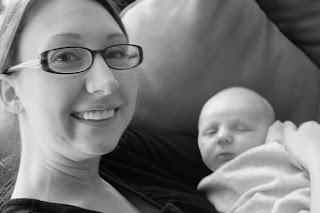 Being a first-time mom, and despite the circumstances, it has been interesting to "learn" to be a mom in a hospital environment. You have a check and double-check for everything you do. They have him under a microscope, and not to mention probably have me under one to as far as what I do with him. And those monitors he is on....boy am I gonna miss those things when we go home. I tried hard today to just look at Liam to see how he was breathing and what sounds and gurgles were "normal" according to the monitors. Over the past few days, I actually found an interesting trend related to his behavior and the oxygen saturation level on the monitor. Whenever he makes his litttle bear "grrr" noises and sighs, his oxygen level actually increases quite significantly for about 30 seconds to a minute. I started really appreciating those little noises, because for me, they now represent an indicator I can use to listen for him at home. I also got to insert a new feeding tube today. It was more scary for me than I think it was for Liam. God bless our nurse - she was so calm and encouraging -she walked me through the whole experience (yes, it was an experience, one that I hope to not have to "experience" again though!). I feel pretty confident that I know how to check the placement and in the event it comes out, put it back in. Thankfully they are ordering us some of that extra sticky hospital grade tape for his face, so hopefully we can make this tube stay in as long as it can! We are praying that Thursday will be the day we take him home. Doctor said today that if things go well today and tomorrow, we can room in with him Wednesday night and go home Thursday - my actual due date! I can not wait!! It will be so great to finally start our normal family life together...whatever that will resemble! Liam is doing great today. He continues to eat about 2/3 of his feedings on his own. Latest news on going home is hopefully middle of next week! The nurses have begun to call Liam "little bear" I have a feeling it's because he sleeps so much and groans and sighs a lot and its sounds like a bear Grrr... =) So cute! Liam is two weeks old today. My prayer is to get him home on or before my actual due date with him, which is next Thursday, October 22. How cool would that be if we could bring him home that day? With the flu season at hand and the swine flu rampant in our area, the hospital has really buckled down on visitors and strongly encouraging people who may be sick to stay home. I got to see Liam breifly this morning and then went to a parent support meeting where I realized I was not feeling well. I decided better to be safe and go home for the afternoon to rest, hoping that it was just something I had eaten. I am feeling much better now (and I think I was overly exhausted), so I thankfully I do not think I am sick. Plus, Liam is dealing with a little diaper rash problem right now and is going constantly. They had to take him off my breastmilk for the next 24 hours and are giving him special formula to help his digestion ease up a bit. Liam is continuing to eat well though, as he is eating at least half of all his bottle feedings on his own. Whenever I can't be with Liam at the hospital, I struggle with feeling guilty for leaving him and I miss him so much. I am trying really hard to not worry and not be anxious about him when I am not there, but it's like leaving your newborn with a different person all the time. Even though they are nurses, they are all different and have different ways of caring for babies. I know I need to take care of myself so that I can care for him when he comes home. I just have to keep reminding myself that God put those people in authority over Liam at that hospital, so God is still in control, even when I am not there to see it. Tomorrow is a new day...hopefully Liam and I will both feel better so we can be together for some sweet bonding time! Liam had his barium swallow test at 9:30 this morning. I got to go with him and watch the test and it was very interesting and I am glad I got to see what the doctors were seeing. They fed him several different consistencies of barium to see which one he can handle without aspirating. They x-rayed him while he was drinking so we could see the flow of the milk go down his throat. Unfortunately, he ws aspirating quite a bit of the normal milk consistency; over half of what they fed him went down his trachea. The said he has a good strong sucking motion, but his swallow is very weak and delayed. The doctors confirmed that they need to add thickener to his milk. The thickener will help the milk go down the right tube plus also help strengthen his swallow muscles. However, it takes more energy for him to eat now because he has to work harder to get his food down. The hopeful news is that the neo-natologist seems to think that Liam’s feeding issues will only take time to overcome and are not permanent, but eventually she thinks within weeks or maybe a couple months, he should resume normal feeding. She did say there is a good possibility we will go home with a feeding tube but it should only be a temporary thing and it will only be for whatever he cannot get down on his own. She was optimistic to start him on the thickened feeds to see how he progresses and said possibly maybe go home by the middle of next week if he progresses well. This was very encouraging news, but I am still going to take it one day at a time and try to celebrate the small steps. 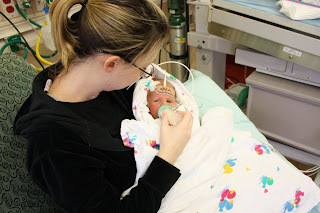 For now, they are bottle feeding him every other feeding and tube feeding in between so he can get rest in between feedings to try to get as much down with the bottle as possible. His first bottle feed today he only got down 6 ml, out of 60 total. But, just now I called to see how his 9:00 pm feeding went and the nurse said he took 20 ml! Yea!! Small steps, but huge progress. Well, we got some difficult news today. They found that Liam's vocal cords have been damaged during the surgery, which is affecting the way he is eating. We were aware that this was a possibility, and even a very likely risk of heart surgery, but it was still hard to grasp. 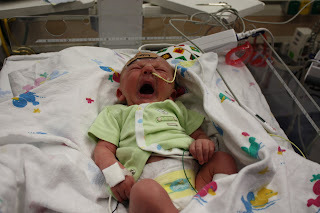 Liam's cry has been weak and hoarse according to the doctors and he is still having trouble feeding, so they ordered that he be checked to see if his vocal cords were damaged in order to make sure he is not aspirating milk into his lungs when he feeds. The ENT specialist did a fiber-optic laryngoscopy on him today that showed his right vocal chord was not moving at all. The ENT is not sure the extent of the nerve damage, whether it is completely severed, bruised or just temporarily paralyzed, and only time will tell how serious the damage is. The neo-natologist ordered a barium swallow test for tomorrow that will show us if Liam is indeed aspirating because of his vocal cord damage or not. If he is aspirating, they will begin using a thickener in his milk to help keep it going down the right tube. The test will also show us how much thickener is needed. 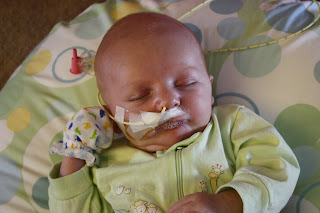 Meanwhile, Liam has to be fed all his feedings through the feeding tube until the test tomorrow. I think it is finally sinking in with me today that our life will be changed forever. Not in a bad way, just entirely different than anything we have ever experienced. I grieved today...I think it helped me to really let all my feelings spill out to God and know that it's going to be OK no matter what, the Lord WILL take care of it for us - He has to and I know my Lord is faithful. Liam is still our precious little boy and how much more thankful I am for all the normal things he CAN do and how he is healing from the surgery. Dustin and I are both in agreement today that we are willing to accept the road the Lord takes us on in this journey and to surrender to it. It's hard, becuase our babies life and well-being are in the hands of doctors, nurses and surgeons and like today, it can be frustrating at times when you feel like you have no control. But God is in control and our focus right now is to just get Liam home, healthy and thriving. It's a little frustrating not having him at home. I feel like sometimes this place is stressful on him, and if he were at home he would be doing fine, and like normal babies, be able to feed on his schedule and get enough nutrition that way. But I know that they just want him in the best shape possible before he goes home too, so it's just been kinda hard. I did try to breastfeed him the first time yesterday...it went ok, but not sure how that's gonna work. I have a lactation consultant coming in today to help, but right now my only focus is to get him eating well enough on the nurses books to let him go home....I think however we can keep him eating, the better. I have so much to be thankful for right now, so it's hard when things get a little discouraging. But Liam is a little champ, everything with the surgery turned out textbook and he is healing great. We are down to the last stretch here, so pray for Liam to EAT! Liam is 10 days old today! I can't believe it has been that long...or that short in reference to his recovery time. He is doing great today again. They bumped up his feeding amount AGAIN to 50 ml. He is still having a hard time getting all that food down, but he is taking more and more each time. The nurse said every 3 feedings he takes the whole amount. But they are pleased with how he is taking the food he is getting - no reflux or spitups really to speak of, which is great because usually heart babies have a hard time with that. It amazes me how God created these little babies to be so resilient...Less than a week ago, our baby had heart surgery, and here he is today, not even needing pain medication!! Unbelievable....God is sooo GOOD and he is faithful! Liam is my sunshine on this cloudy day! He had his chest lines removed early this afternoon and he has been doing wonderfully all day long. They are letting me hold him now for feeding! It is so great to be able to hold him again. However, mom is not an expert by any means on feeding him...He did not eat very well for me for his first feeding this morning. His second feeding was not any better, so the nurse stepped in and helped me out - He ate his WHOLE bottle with her help!! I was so proud of him!! I am determined not to go home with a feeding tube, so today was a huge milestone for us. It is great to be a part of his routine again. Slowly the nurses are letting me do more with him now that IV's and things are slowly coming off. He is even down to one fluid through the IV now (he started with 12 different fluids!) I am more excited to get here every morning to see how he is progressing, and every late night phone call to the nurse just gets me even more pumped at the progress he is making. Despite our little feeding setback, I think we are on our way now. Speaking of eating, I just ordered my breakfast from the hospital. Up in the cardio unit they put me on the meal plan where I get 3 meals a day here for free. It is really great and definately helps out. They deliver it right to the room, so I don't have to be away very long. It's been nice not having to plan meals and the food is actually quite good! Today is my first day here by myself. Dustin had to go back to work today - I am trying to text him all the little milestones when I can =) It must be hard for him to not be here...we were getting used to coming here together everyday. He is going to be here on his lunch break and then after work, so at least he can spend some time with Liam everyday. Liam just adores him...and so do I! Liam is still doing great this afternoon...what an amazing and brave little man we have! He is now eating from a bottle very well so far, so they took him off his IV "food". Hopefully if he stays eating well, he will not have to experience a feeding tube. It was sad today because he got a vaccine shot for RSV and they also were trying to find another IV entry point on his little body (he has probably had a total of 5 or 6 IV's all in different spots so far), so he was being poked and prodded for a little while this afternoon. He was soo good, but did cry at one point while they were trying to put an IV in his little foot...That was hard for me to hear. But I kept telling myself, babies cry - that's just what they do. I guess I have never heard him cry for a normal baby reason, so my heart is tender for him when he does....They never did get a good line for him, so they said they would have to try again later...Poor little guy. I can honestly say it does get very depressing at times, more often than I would like. But this poem resonated with me the truth about the raw emotion that comes with this type of event. Every time I start to feel angry, upset, depressed, God (and also my wonderful husband) tells me it's ok to feel that way...for He created our feelings and He is more than willing to help us cope with them and act on our behalf as we ask for strength and courage. I pray that no mother has to experience this...and for those of you that have, I pray that God honor you in a special way, whether it be to give you an awesome birth experience with future children or to allow your children to grow strong and healthy and be a living testament to what the Lord can do. Hard to believe it has already been one week since Liam was born. Time has sometimes flown by and sometime stood perfectly still, but the Lord has done mighty works in this short period of time. Liam is doing really well this morning. His chest tube came out last night and the nurse bottle fed him for this first time this morning! Huge praise!! She said he ate about 38 ml, which is 3 times the amount he was getting before surgery - She said he sucked it down in 15 minutes! This is not looking good for our grocery bill later on in life!! He is sleeping peacefully right now. His little angelic face is truly the joy of my life....I cannot WAIT to take him home so he can be all mine!! Liam has had a really great day today. He was awake for a while this afternoon, but content and happy. He even had a few bouts of the hiccups which is a good sign =) It was so great to hear his little sounds again. I really miss his little noises and whimpers. They started him on a "food" IV this afternoon to get him more nutrition than just the saline/sugar drip he had been receiving. They even said by tomorrow morning they expect to maybe be able to start bottle feeding - so exciting! He is also getting his chest drain removed hopefully tomorrow as well. I was thinking earlier today about Liam's scar on his chest and how blessed I am to have had a little boy. How awesome it will be for him to show off that brave scar he has!! I know at the beginning of my pregnancy, I was convinced I was having a girl. But just as God always does, He gives us what was purposed and what He knew we needed, even when we had no idea what lie ahead. It is going to be a GOOD night =) Thanks be to GOD in the Highest!! This morning has been really hard for Dustin and I. Liam is doing really well right now, we just said our goodbyes and he is on his way to surgery. God is so good, this morning we arrived here about 5:00 am and we got to hold Liam until 7:00 am...What a HUGE blessing that was..to have sweet time with our little guy before the surgery. I really cherished that moment with him. The Lord is soo good....The nurses all respected our time and it was so peaceful and quiet, we got to pray over him a few times before we had to walk him down to the O.R. The surgery is supposed to take anywhere from 4 to 5 hours. There may be some other issues the surgeon has to fix besides just the stunt once he goes in. We were prepared for that, but praying that the surgery goes as planned and they won't have to go to Plan B. We will keep everyone posted on his progress. Again, thank you SOOO much for everyone's love and support. Dustin and I appreciate all the messages and visitors we receive. God bless little Liam today for a smooth day!! Liam's surgery will be tomorrow morning. We spent the whole day up at the hospital, as we have been doing since Friday, and it was a good day today. The nurses let Dustin and I feed him and change diapers when we are around for it, so that is great because it is the closest thing to actually holding him. We get to prop him up in his bed to eat and burp him. I never knew I would actually appreciate getting to change his diaper, but I really do cherish those times with him. Dustin does as well, and Dustin even got a taste of the little boyhood today as Liam pee-painted his shirt today during a diaper change! Hospital days are long, and I am trying to heal, pump and spend time with my little one and get some type of routine down. 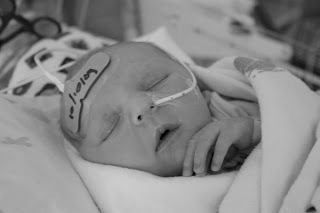 Just as we are getting used to being in the NICU, Liam will be moved to the PICU Cardio Unit after surgery tomorrow. He will have his own room. Well, it is getting late and we have a long day ahead of us. We plan on arriving tomorrow at 5:00 am so we can spend as much time with him as possible before he goes in for surgery. 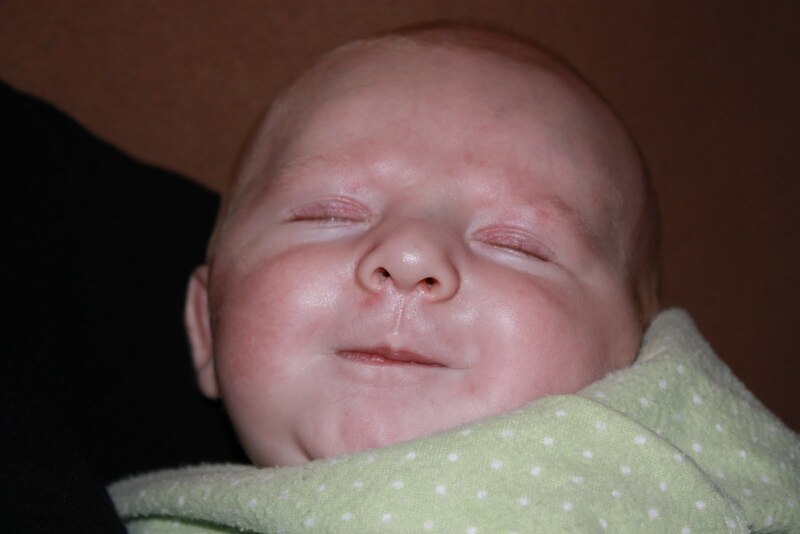 Goodnight my little Liam, may the Lord bless you and keep you, and may his face shine upon you! He is in GOOD hands!! Liam arrived at Medical City around 4:00 am on Thursday morning. Dustin rode in the ambulance with him from Baylor to make sure he arrived safely and to see where he would be staying. Dustin and my dad made trips back in forth between Medical City and Baylor, between me and Liam. Lord bless Dustin for having to take care of two of us. I can not imagine how hard that would be to have the two people closest to you in two separate places, me trying to recover and Liam being prodded and poked and hooked up to machines. But it only reminded me of why I married him and I love him more today than I ever thought possible. I arrived at Medical City at about 11:00 am Friday morning. My beautiful baby boy looked so normal and so healthy, it was hard to imagine he had anything wrong with him. We share a room with another baby heart patient who recently just had surgery. 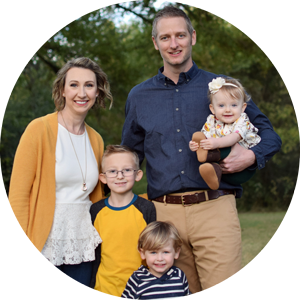 It was such a blessing, as they have the same cardiologist and heart surgeon as we do, so they have plenty of NICU experience and great wisdom to share with us. Right now the Doctors are keeping Liam alive by giving him a drug called Prostin that keeps his PDA temporarily open until they have a plan for surgery. We met with the surgeon, Dr. Eric Mendeloff, at 3:00 that afternoon, and he described Liam’s condition and explained there will be two surgeries. The first surgery which will be Monday, October 5th at 7:30 am. His procedure first involves opening up his chest and putting in a BT Shunt so that they can take him off the medication that he is taking to keep the PDA open. This will then allow the PDA artery to close. The second surgery will be done later next year when Liam is between 9 to 12 months old and has had time to grow and get stronger, so that his heart is ready for the larger surgery which will build the valve in his right ventricle that feeds his lungs and patch the hole between his left and right ventricle. 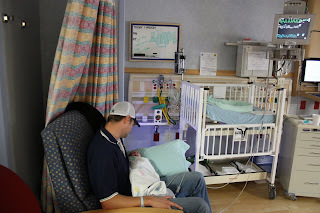 Without my new son in the room, the hospital felt like more of a prison than a joyful place to celebrate a new life. Despite the wonderful friends and family we had to come and pass the time and pray with us while visiting (Sincerely thank you to ALL of you who kept us in your thoughts and prayers, we are BLESSED to have you in our life), the comfort they could provide lasted only for a short while before my emotional roller coaster began again. You never expect to be a new mom and not be with your baby. That was by far the hardest part for me to bear. I prayed continuously for Liam. Dustin and I had to encourage one another and keep reminding each other that this is “all in God’s hands.” I had always said at the beginning of my pregnancy that this is truly the Lord’s baby, and not my own. He simply blessed Dustin and I and chose us to be his parents. And if that were true, he is still in the Lord’s hands, forever and always. It was also a new experience for Dustin and I as we are a relatively newly married couple having to cope in a new way, together for the first time for a family, and not just ourselves. It is a whole new dynamic for us, with both of us handling grief and emotions in different ways and trying to be there for each other. It has definitely grown us closer as a couple and also in our walk with God. Finally, Friday morning I was discharged from Baylor and headed straight to Medical City to see my little Liam. What an anticipation I had, for I really had not seen my new son except for in pictures and video.